Imagine managing an interpretive exhibit that runs six days a week. A hands-on learning space requires coordinating the floor schedule for staff and volunteers; communicating with museum ambassadors; keeping records of visitation, volunteer hours, and consumable materials’ use; and working to evaluate and improve visitors’ experience in the space. The Floor Manager of Spark!Lab, Jocelyn Knauf, handles all these responsibilities and more. The third feature in our Staff Spotlight series focuses on a one-year veteran of the team. Jocelyn is in Spark!Lab five days a week — Tuesday through Saturday. Consequently, among the entire floor staff, she’s the most in-touch with the exhibit’s everyday goings-on. The next time you stop by, be sure to thank her for her dedication! Besides tackling her extensive to-do list, Jocelyn was kind enough to answer some interview questions. Did you have a background in maker spaces previously? What about working with children? Are there any previous work experiences you’d like to mention? I don’t have an extensive background working with maker spaces but have been immersed in the scientific and invention processes since I was young. My parents were both scientists, and my mom in particular is always fixing and tinkering with things (plus she holds two patents for her work on ovarian cancer). I was always encouraged to explore my interests, see the world in terms of what could be improved, and then think about and try out possible solutions – things that I now try to encourage our Spark!Lab visitors to do. Although they are not children, my formal teaching experience has been in a university setting, teaching classes related to archaeology, material culture, and American Indians. I also worked primarily with elementary-school students in my previous job as an Education Specialist at the College Park Aviation Museum. I really enjoy working in a museum setting with kids because I see our primary responsibility as inspiring further learning, instead of making sure that they can regurgitate specific facts and figures. Teaching critical thinking and problem-solving skills can be very challenging but also a lot of fun — and never boring! I have worn a lot of “hats” in my professional career. Working for a law firm, universities, museums, and a yoga studio, I have done everything from everyday operations to writing and editing scholarly articles and technical reports, developing educational programs, and doing evaluation work. I have been lucky enough to pursue projects that interest me and consider myself very curious and a lifelong learner. Where do you think you’ve been the most successful? I think that we have been really successful in facilitating great experiences for families and school groups. Part of my job is compiling our visitor responses, and I am always so excited to see how many visitors reference how much they enjoyed being involved in the invention process and how much fun they had. I have two favorite things. First, our volunteers: We are lucky to have an amazing corps of volunteers who really believe in what we are doing in Spark!Lab and in getting kids excited about invention and history. They come from a huge diversity of backgrounds, both personally and professionally — we have students in everything from engineering to public history and museum studies; working and retired scientists, engineers, business professionals, and teachers. They bring such a depth of knowledge and experience, and I learn from them every day. Second, I love the flexibility of the space. There is no one way to complete any challenge in Spark!Lab, so we do not see the same things day-in and day-out. We can change the configuration of the space and also change out all of our activities three times a year, which keeps things fresh for our volunteers and staff as well as for the visitors. It is hard to think of anything. If I had to say something, it would be preparing the cardboard, which visitors use to construct prototypes of their own inventions. Left: Eddie Van Halen's Frankenstein guitar. Right: A vehicle made in Spark!Lab inspired by the Frankenstein guitar. What’s your favorite invention a visitor has created? 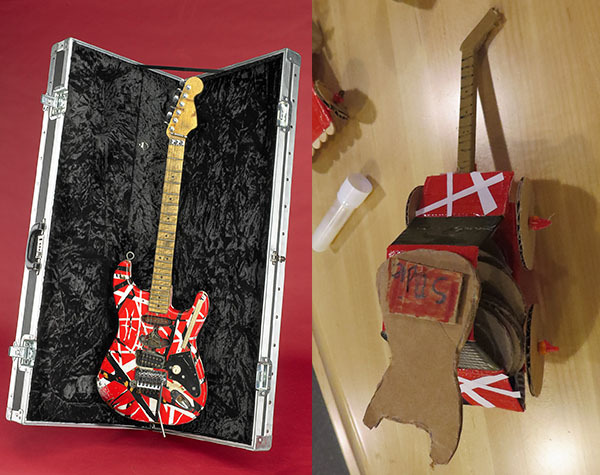 If I had to pick one, I would say it was when we had a young visitor who was inspired by Eddie Van Halen’s Frankenstein guitar, which we have on display in the space, and she created her own Frankenstein-inspired car. Like the guitar itself, it was a hybrid creation, and its inventor combined elements she liked about music and cars and was also super detail-oriented in mimicking the paint job. She embodied the qualities I love to see in our Spark!Lab inventors: curiosity, thoughtfulness, and a willingness to try things out to see if they are going to work. I don’t know that I think of myself as an inventor, but recently I moved into a new house and have done a lot of tinkering and repair work since then because it was definitely a fixer-upper. I have been very proud of myself when I have found solutions to some of our practical and design problems, and I was pretty proud the other day when our contractor told us that we had vision to bring the house back to life. I consider myself inventive and innovative, although as I mentioned above, I don’t necessarily see myself as an inventor. I really enjoy exploring topics that interest me, thinking up different solutions to problems or ways that I might improve on my approaches to things, and constructing new knowledge from them and trying new things out.